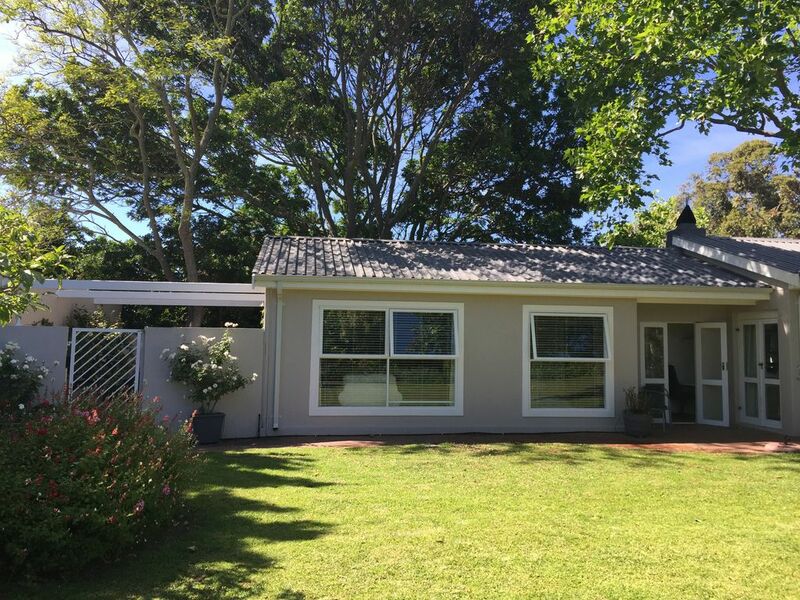 Sunny and spacious garden cottage, close to beaches and wine farms. Our sunny cottage has a spacious lounge/dining area, fully fitted kitchen, large bedroom with double bed and lots of cupboards, good size en suite and a storage area in which you can pack away any large items making a long stay very comfortable. The TV in the lounge has full DSTV and there is WIFI. You will be able to enjoy a BBQ on your own patio, looking onto the pretty garden. Your private entrance leads off an attractive courtyard. You will have access to our sparkling pool. The cottage is fully secure with burglar bars on the windows and we have burglar garden beams which are alarmed at night, which you will be able to operate with a remote control. We are situated in the charming and convenient village of Tokai, within 5 mins drive to a number of prominent wine farms, restaurants, pubs and two golf courses. The beautiful beach of Muizenberg, which affords great swimming, body boarding and surfing in the Indian Ocean, is only 10 mins drive away. You will also find vibey coffee shops and bars along the beach front. Hiking or mountain biking is also only minutes away in the Silvermine Range of mountains. Easy access to The Blue Route shopping mall and a laundromat. Small table and 2 chairs overlooking pretty garden. The pool is unfenced without a cover. We stayed here for 5 weeks. Carol and Justin were wonderful hosts. They were there to please us. The cottage has lots of privacy and the garden is beautifull. The neighborhood is safe.There is a swimmingpool and the cottage is basic but everything you need is there. Its close to shops and restaurants and Cape Town downtown is only just 20 min. away. Thank you Carol and Justin to make our stay just wonderfull. Hope to visit you again. Herman and Lydia, The Netherlands. It was a great pleasure to host Lydia and Herman. They were friendly but discreet and very appreciative of everything. They looked after our property and left it clean and neat. We really enjoyed hearing about their life in Europe and The States. We are situated in the quiet and convenient village of Tokai, within 5 mins drive to a number of prominent wine farms, restaurants, pubs and two golf courses. The beautiful beach of Muizenberg, which affords great swimming, body boarding and surfing in the Indian Ocean, is only 10 mins drive away. You will also find vibey coffee shops and bars along the beach front. Hiking or mountain biking is also only minutes away in the Silvermine Range of mountains. We are 20 mins away from Cape Town CBD and The Waterfront with their plethora of bars, restaurants, night clubs and culture.